Click on Dash home, then click on "Media Apps", "Internet Apps" or "More Apps". The apps list is not getting populated (see the attached screenshot). The bug is actually in the lenses themselves. IRC quote: "< njpatel> Kaleo, hey, yes, this used to be an issue with third party lenses too. The code you reference is actually not the useful bit, I didn't realise I left it in so have removed it from trunk. The useful part is LensView::OnActiveChanged and, in the same file, lens_->connected.changed.connect.... between those two, the LensView handles starts and restarts of lenses correctly"
In the applications lens, line 100 of utils.vala in the applications lens considers that the old_search (null) is the same as the new_search (""). The same code is duplicated in the files lens. But the bug also occurs with the music lens and the gwibber lens. hence when getting to line 229 of unity-scope-private.vala the new "" search is discarded. I've linked branches for the lenses. I think Gwibber is not displaying initial results for different reasons, will investigate separately. I do not think anything needs to be fixed in libunity, unity-lens-search makes the initial search_string = NULL from my tests, so I think the main issue was with the daemons ignoring the null search (they were all doing this apart from Gwibber). In my tests (with the workarounds in Unity removed), they all display results initially, so I hope this fixes the issue for 2D too. * Fix a segfault due to new unity service backend change. I've just installed updates, rebooted PC, but I still have the problem. My application menu is totally empty. Re #8: I had the same problem (still empty after update), but somehow managed to get the lenses to populate by searching for "", then hitting return. I cannot remember the exact sequence, but magically it all populated. Perhaps it was actually generating the list in the background while I was fiddling. I can confirm that the lenses do populate as described in comment #9 by entering "" in the search, waiting a second and then deleting the "". However, the list is only available during the present session. Logging out and then back in shows nothing in the lenses once again and must be repopulated. Hi, I have Unity-2D v4.12 installed in Oneiric and experience similar problem. In default mode app-lens shows no results. If I chose it from list below — it works. But results disappears as soon as I switch back to default or just re-open dash. #9 and #10 doesn't work for me. 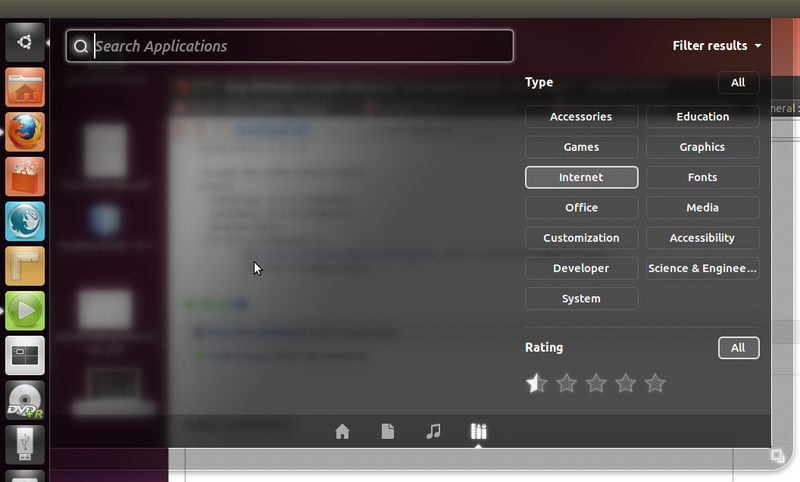 Using 4.24.0-0ubuntu2, I very frequently have all of my Apps lesnes completely blanked out, including no buttons. This even happend to me right away on a restart. Is this related? I got the same (or a similar?) error with Unity and Unity2D (two different laptops). From dash, I cannot start any apps but the four favorites. If I search for them I only get files and music as results. Even Alt+F2 doesn't work. I purged and reinstalled unity, the lenses, places and zeitgeist several times to solve the problem. After the reinstalls, dash sometimes worked fine for some ubuntu-restarts, but the error came back every time. 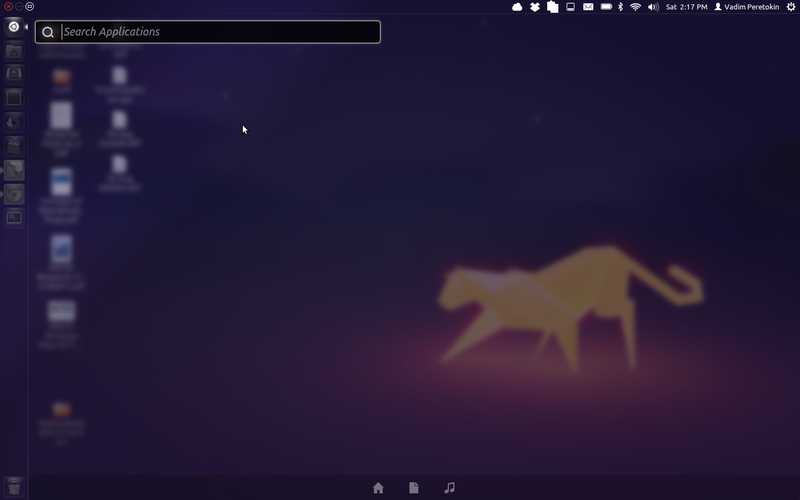 Gnome shell doesn't have that error. Both systems was upgraded from natty. It seems that a "unity --replace" solves the problem for me, but I have to do that every time I start ubuntu. Annoying!